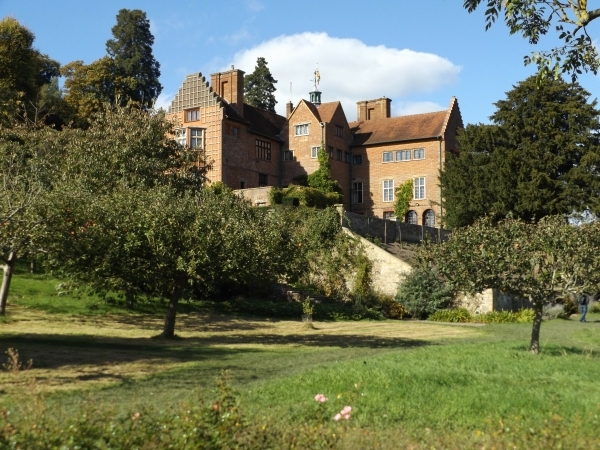 Parking: Park in the National Trust car park at Chartwell - free for NT members and £3 for others. The car park is open every day except Christmas Day and Boxing Day from 9am until 5.30pm or dusk if earlier. Leave the car park by the exit (past the restaurant, shops and toilets) and turn left along the road past the house. When the wall on the left ends, there is a lay-by on the right where you could park if you cannot use the National Trust car park. Take the bridleway just past the lay-by uphill through woods. When the path levels out somewhat, take a left turn, waymarked “National Trust Limpsfield Walk”. 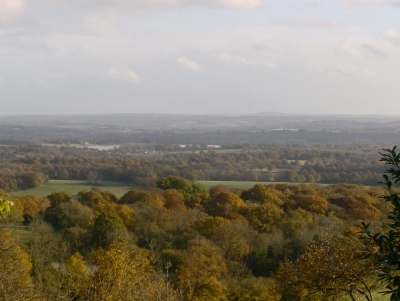 Continue alongside Mariners Hill, with magnificent views across Bough Beech Reservoir towards The Weald. Follow the path downhill until you reach Froghole Lane. Turn right. When the lane turns sharp right, turn sharp left down a path immediately before a house called Spark Haw (not the path immediately beyond, signposted “Crockham Hill Church”). This path between two houses is not signposted but there may be a couple of waymarks on the fence (they come and go). Go downhill between fences, across duckboards then down the left hand edge of a field to an asphalt track. Bear right to a path over a stile just across the track. Cross the middle of one field, follow the edge of another and then start to follow the edge of a third. When the hedge alongside this field turns sharp left, carry straight on across the field to a gate soon followed by another gate. Cross a paddock and go through a third gate to reach a farm track. Turn left along the track through Grange Farm and follow all the way (just over half a mile) to a road. Turn left along the road and take the first track on the right through a gate. Follow this track past Obriss Farm and through a gate. Turn sharp left and walk along the left hand edge of the field. Cross the next field diagonally right, going over the highest point of the field to the far corner, then along next field edge. Go through a short section of wood, then steeply uphill to enter more woodland and along track between hedges. Continue round a sharp left hand bend, a steep section and then a sharp right hand turn (the gate straight ahead leads to a private house (Bardogs), but the path on the right is not obvious until you get right up to the gate). Follow the path up to the road and turn right uphill. Soon there is a seat and a view point by Octavia Hill’s Well on the right where you can stop to rest and admire the scenery. Continue along the road to the centre of Toy’s Hill village. Just past the red telephone box on the left take a path going quite steeply uphill. Follow this path, bearing right and climbing steeply at first junction. 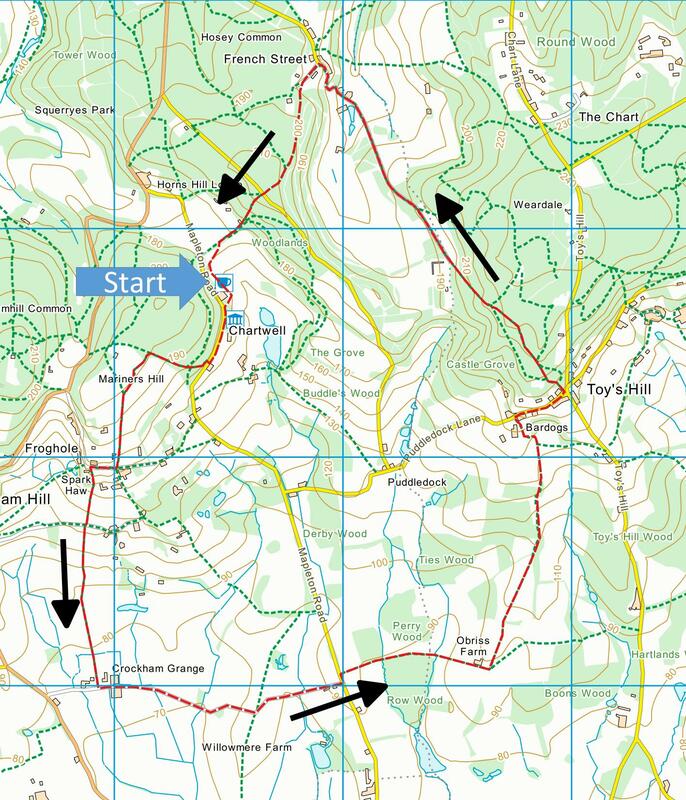 Carry straight on or bear slightly left at all later junctions, soon joining the Greensand Way and following the blue waymarks. The path first climbs and then descends, emerging from the wood near the former French Street nursery. Continue along a level track to a lane coming down from the right. Follow this lane downhill to the valley bottom, then uphill through French Street. In the middle of French Street, turn left along a drive (tarred initially), well signposted with various waymarks including one for the Greensand Way. Bear left when the hedge does, and follow Greensand Way markers until you reach a road. There are two paths on the other side of the road. Take the one on the left downhill and back to the Chartwell car park. The tearoom is normally open from 10 to 5 (not Christmas Day or Boxing Day). The well with views of Bough Beech reservoir (Walk 18) and Ashdown Forest was one of the National Trust’s first properties, given by Octavia Hill, one of the Trust’s founders, who lived and is buried at Crockham Hill (Walk 14). Home to Winston Churchill until his death in 1965. Our book of Ten Favourite Walks in the Kent Countryside has routes for ten more walks like this one. Ramblers' volunteers in Kent work tirelessly to ensure that our paths are as well protected and maintained as possible. Of course we also organise led walks but most of our members are independent walkers who simply want to support our footpath work. Please join us and become a supporter too. You need us and we really need you.